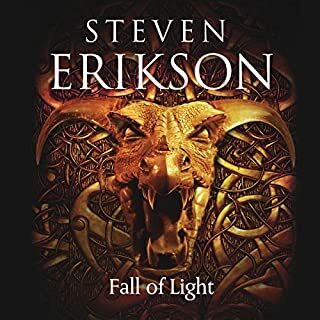 The epic new chapter in the history of Malaz - the epic fantasy from Steven Erikson's friend and co-creator of this extraordinary and exciting imagined world. Darujhistan, city of dreams, city of blue flames, is peaceful at last; its citizens free to return to politicking, bickering, trading and, above all, enjoying the good things in life. Yet there are those who will not allow the past to remain buried. A scholar digging in the plains stumbles across an ancient sealed vault. 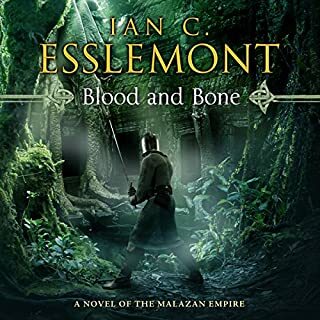 The merchant Humble Measure schemes to drive out the remaining Malazan invaders. And the surviving agents of a long-lost power are stirring, for they sense change and so, opportunity. While, as ever at the center of everything, a thief in a red waistcoat and of rotund proportions walks the streets, juggling in one hand custard pastries, and in the other the fate of the city itself. 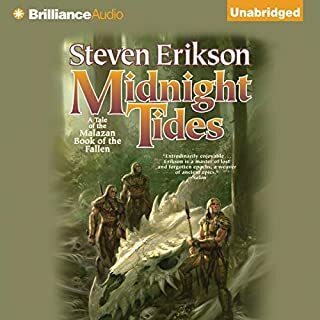 Far to the south, fragments of the titanic Moon's Spawn have crashed into the Rivan Sea creating a series of isles...and a fortune hunter's dream. 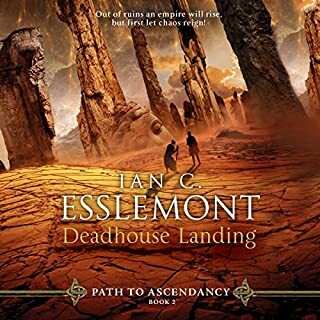 A Malazan veteran calling himself 'Red' ventures out to try his luck - and perhaps say goodbye to old friends. 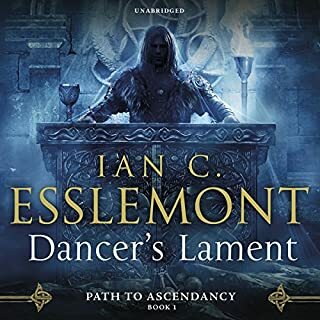 But there he finds far more than he'd bargained for as the rush to claim the Spawn's treasures descends into a mad scramble of chaos and bloodshed. For powers from across the world have gathered here, searching for the legendary Throne of Night. The impact of these events are far reaching, it seems. 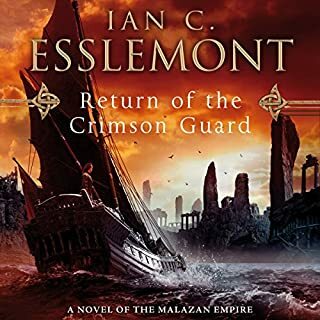 On an unremarkable island off the coast of Genabackis, a people who had turned their backs upon all such strivings now lift their masked faces towards the mainland and recall the ancient prophesy of a return. 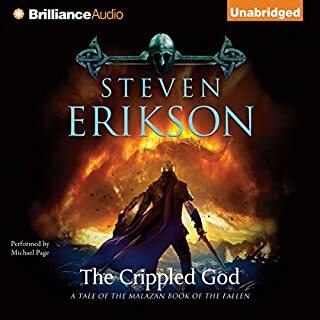 And what about the ex-Claw of the Malazan Empire who now walks the uttermost edge of creation? His mission - the success or failure of which the Queen of Dreams saw long ago - is destined to shape far more than anyone could have ever imagined. ©2016 Random House Audiobooks, all rights reserved. 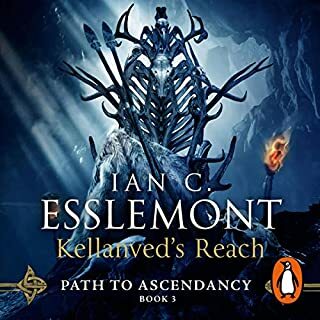 ; 2012 Ian Cameron Esselmont. 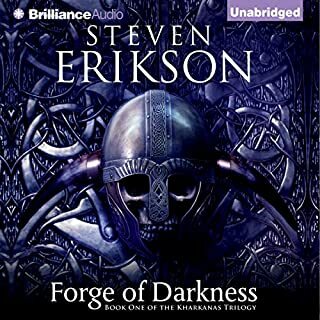 The brilliance continues with brilliance audio! 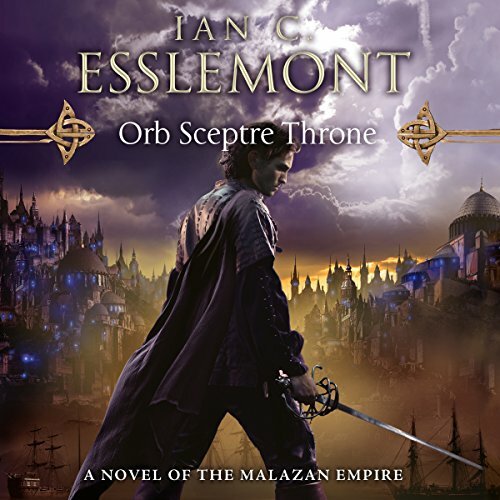 Another epic story told to a captivated malazan fan! 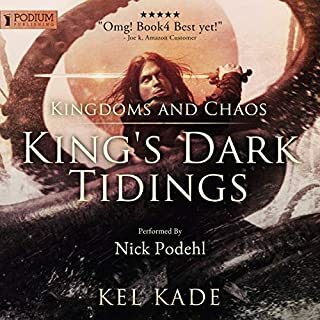 After MBotF, this & the other stories in this series are welcome off-shoots..but PLEASE would the narrator at least LISTEN to some of the original stories? Learn to pronounce the names as already established? & basic pronunciation of normal words ...come ON. 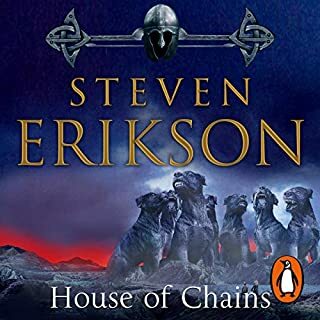 The storyline is engaging & new characters are fun to get to know, but I did NOT like the changes made to one very well established major (in BotF) character's persona. 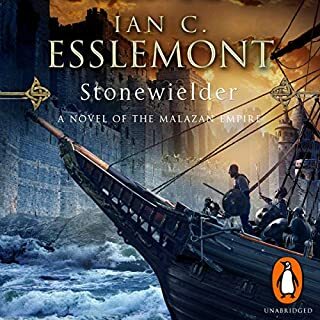 If you're familiar with the Malazan world, you'll have to adjust a bit, but all in all, it's a good story. These really are the best. 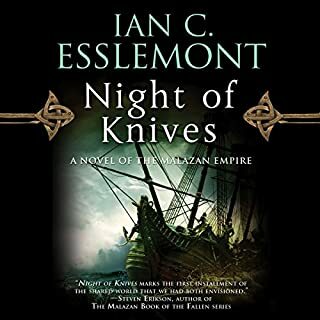 Novels of the Malazan Empire are the best, even among hundreds of fantasy and science fiction books, they are still the best. Above all, these books are always "fun". The worst sort of catastrophic apocalyptic event could be happening, but the author has no interest in despair. instead you are helped through a wonderful adventure by relatable likeable people. This book is pure member-berries. 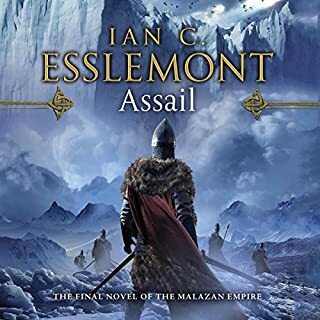 Esslemont brings back many of the old Malazan characters! Fantastic! I feel like cam finally truly hit his stride with this one. Moreover the incredible intricacy of the universe amazed me yet again. I didn't think it was possible for there to be yet more backstory to far flung genabackis, but yet there it was seamless as always. 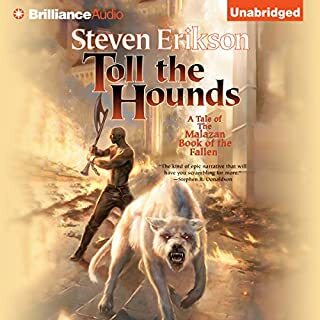 I love everything Malazan and this book did not disappoint in literature or narration! It was very very entertaining! 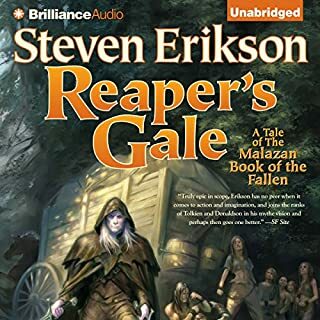 Great story from the Malazan world. I enjoyed how familiar characters were brought back but mixed with new in depth characters as well. can't wait to start the next....here I go. 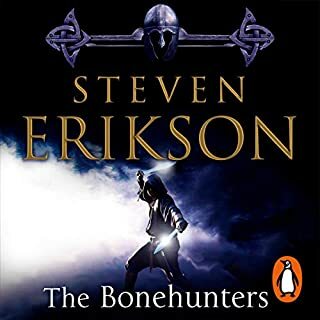 The only reason this didn't get five stars all the way through is the annoying habit of the various narrators to refuse to listen to previous books in the series and learn how to pronounce the names of the characters. 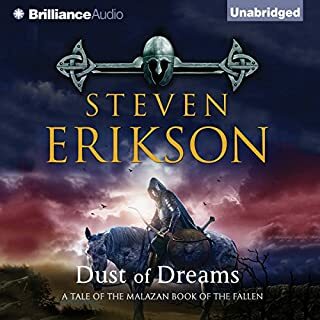 Epic in usual Malazan fashion, it feels great to see all the loose.strings in Derugistan finally come to a close.